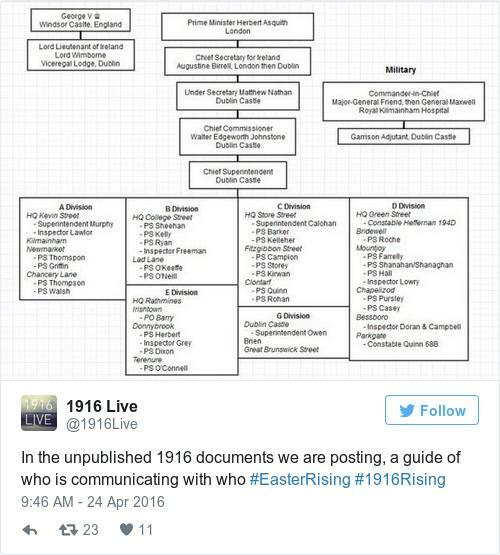 Documents relating to the Easter Rising are being released online, 100 years after the event took place. 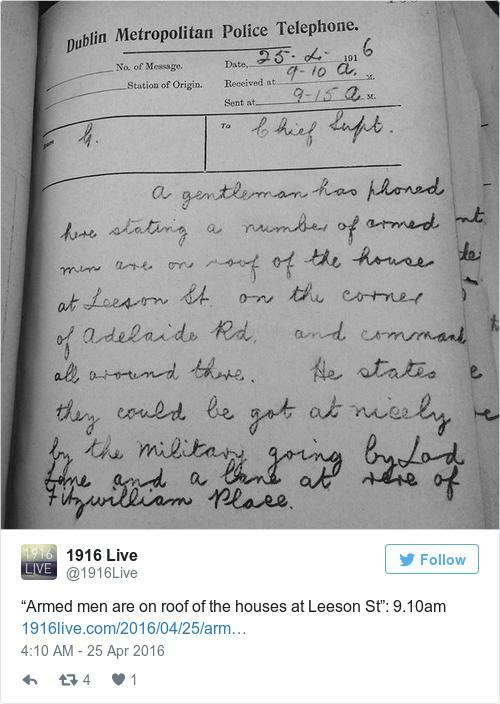 The project will post hundreds of internal police telephone messages, secret government communications, telegraphs and letters from the collection of the University of Oxford’s Bodleian Libraries under the Twitter handle @1916live and on 1916live.com. The files span the course of the rebellion, from the outbreak of fighting on 24 April to the surrender of rebel headquarters on 29 April. Many of the documents were time-stamped to the minute. Sir Matthew Nathan, the top civil servant in Dublin Castle, compiled the documents and took them out of Ireland in his personal papers after the Rising. They were given to the Bodleian Libraries following his death. The project has been carried out by a team of volunteers led by journalist Naomi O’Leary, who came across the files while researching a documentary. “Many of them are clearly written in great urgency in the middle of the upheaval of the Easter Rising, and their concision and immediacy makes them a gripping account of this key moment in our history,” O’Leary said, adding that they paint a “rich and nuanced picture”of the rebellion and the response of British authorities. O’Leary added that she hopes the project “helps the documents to reach a wider audience and gives rise to further study”. I think it’s particularly appropriate to release them on social media, 100 years to the minute since they were logged, as the telephone messages are the records of a relatively new system of technology that allowed for instant communication — affording Dublin Castle an important strategic advantage over the rebels. The documents were gathered as evidence for the Royal Commission on the Rebellion in Ireland. Mike Webb, of the Bodleian Libraries, said hundreds of Dublin Metropolitan Police messages, scribbled on pink sheets of paper apparently taken from message pads, are included. They give an extraordinarily vivid street-level view of the rising hour-by-hour. “This will bring a somewhat neglected source back to life – patchy, sporadic, instantaneous, sometimes confused reports that allow us to see history as it happens rather than filtered through decades of reflection and discussion,” he added. I have heard much disquieting rumours as to mischief brewing – I trust they are without foundation. 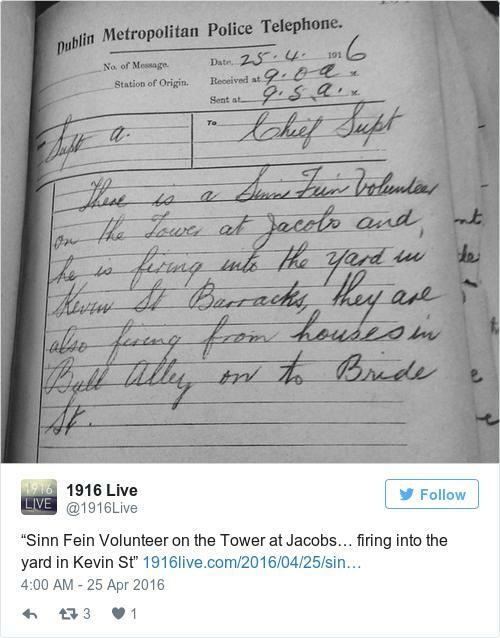 The Sinn Fein volunteers have attacked the castle and have possession of the GPO. They have Stephen’s Green Park in their hands and have turned out the people and locked the gates. While in plain clothes at North King St endeavouring to purchase bread, I was made prisoner by the Sinn Fein Volunteers… I did not know any of the volunteers, but think they were all Dublin men and would know them again, Commandant Daly’s name was mentioned the majority were in plain clothes, wearing green hats. Mrs McGrath cleaner here who lives in North Brunswick St. has made her way down a few minutes ago, and she states that there are people on top of Richmond Hospital, signalling to Sinn Feiners the movements of military… she thinks some of the people on the hospital are students but there is no doubt they are giving Sinn Feiners all information they can. My wife, three children and myself are starving here and the military will not allow us out could you please do something for us. More documents can be viewed here.